VICTORIA — It’s basically a spruced up downtown outhouse, but Victoria’s so-called Langley Street Loo is now known as Canada’s best restroom. 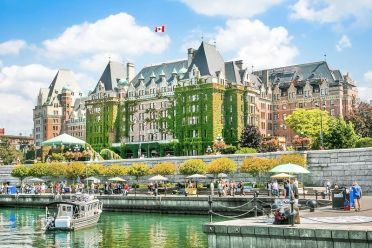 A nationwide contest saw Victoria’s outdoor, public restroom top four other — much appreciated — washrooms in Vancouver, Toronto, and Repentigny, Quebec, for biffy supremacy. Victoria Mayor Dean Fortin said Tuesday he couldn’t resist engaging in a bit of toilet humour to mark the occasion as he accepted the award-winning plaque during a ceremony at the restroom.